This gallery features images of wood carvings completed from 2007 – 2013. Click on any image to below begin the slideshow feature. Celtic Birds carving in basswood. 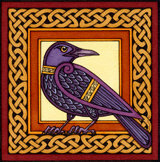 Detail of Celtic Birds carving. Detail of the completed Shattuck Fellows plaque pelican carving, carved from Spanish cedar. The completed base of the Shattuck Fellows plaque on the carving bench. The completed Shattuck Fellows plaque. Hand carved sign in mahogany. Great Blue Heron carving in basswood with painted finish. Detail of Great Blue Heron carving. Celtic Bear carving with painted finish. Detail of the painted finish on the Celtic Bear carving. Celtic Bear carving in basswood. Detail of Celtic Bear carving. Hand carved dragon beer tap handle. Hand carved crow beer tap handle. Wood Carvings: Carving projects completed from 2012 to the present can be seen HERE. Form Plaque Project: A gallery of carvings commissioned by St. Paul’s School can be seen HERE.